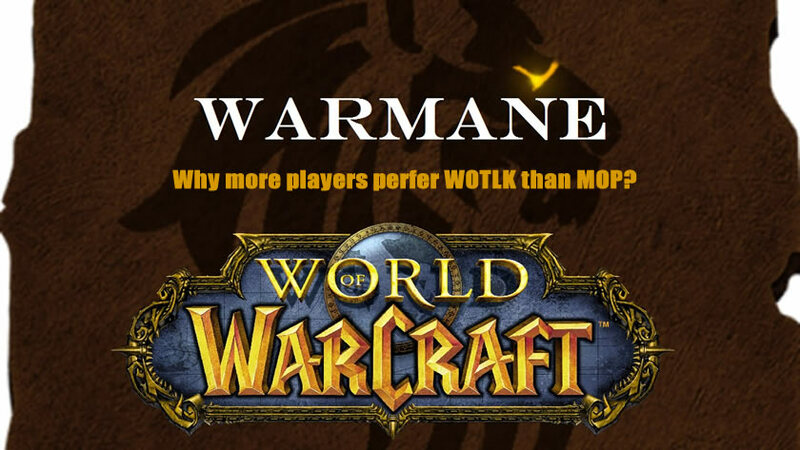 Why more players perfer WOTLK than MOP in Warmane? Previouly, many palyers choose to play in Mists of Pandaria(MOP). However, there are more and more players in Wrath of the Lich King(WOTLK). According to related data, now there are usually at least 7-8K+ players on Icecrown and Lordaeron, but rarely over 1,5K players on Frostwolf. Why is that? What attraceted so many people to paly in WOTLK rather than MOP? Which would you perfer or which should you choose? We have summarized some views in the below. WOTLK had THE LICH KING. Dungeons don't exist in MOP. Tanks can solo hc dungeons, and literally you can go and solo them in WOTLK. Among top of that there is 9 dungeons in MOP and 16 in WOTLK. The same for raids 5 vs 9 raids in WOTLK.PVP wise,sure MOP 5.4 is way more balanced but WOTLK pvp is bilion times more enjoyable and funny. The gear you wear matters. You can use PVe items for PVP and also you can do Wpvp aswell in WOTLK. The CC in WOTLK is not as bad as in MOP when you sit for 1 min in CC chain. Besides, The worse part in MOP is that there is so much CC that every team can keep you almost permanently in CC. Semi good player can get same results as the best players, which is also the main reason for so many TOP pvp players massively quit in MOP. Talent tree in WOTLK is infinity better while the talents in MOP are simple boring and dull. As for legendary cloak, everyone had legendary cloak in MOP on retial and it is useless. If you didnt had it people refuse to invite you for raids. WOTLK have way more content and it is more enjoyable. In fact, MOP is a little dull and boring. Simple didnt work as expansion,. even on retial everyone hate MOP. WOTLK PVP is more Dynamic and fastpaced. It is more punishing for mistakes and that is a good thing for palyers,. That pushes you more to improve, because if you don't than you will be stuck forever. It's like a better reward system for skill development, you not only get higher rank, Achieve and Bragging Rights, but better (more exclusive) gear as well. Players also like the fact that the skills are more exclusive on WOTLK than on MOP. On MOP everyone was a powercreep and everyone had a stun, interrupt, silence etc. While on wotlk skill types and playstyles are more varied, which adds the entertainment and challenges. Some palyers don't like the hp in mop (too much hp numbers) and the pvp. It has too mutch buttons. WOTLK seems to be more serious that's why i like that expansion...Cata and Mop don't have what i like. Some players really like WOTLK's immersive and incredibly fleshed out story, handing down the most enjoyable and interesting they found on a MMO. The gameplay just does not feel quite the same like before in MOP and some people just dislike the pandas and the asian theme. Once MoP came along with pandas, asia and revamped talent trees etc, which causes the game was no longer recognizable as the way people remembered it from 2008-2010. However, some players still stay in MOP. They think that MOP is actually WOTLK + Cata/Mop leveling, which brings up more content IMO. They don't believe that mechanics are bad in MOP. They insist that MoP has the best setting and the remake of the questing made the game a bit more user friendly and orderly and MoP is a better expansion for PvP. In MOP, they think talents are much more fun to choose and they actually contribute to the combat itself. There are more maps, more hp making and it's more forgiving for the mistakes you make in PVP, better endgame with more raids. They say WOTLK has lich king raid and that's very respectable but no advantage beside that one. They believe that In fact MOP had more population when it was the main focus for development and the reason for its loss of players is only that WotLK became the main focus of the game. So what do you think? Which one you do you perfer?